I'm a sucka for gold sneakers. I must have been a pimp in my last life. With the 2016 Wimbledon championships around the corner, Nike is gearing up for the Grand Slam tournament with another tribute retro sneaker. 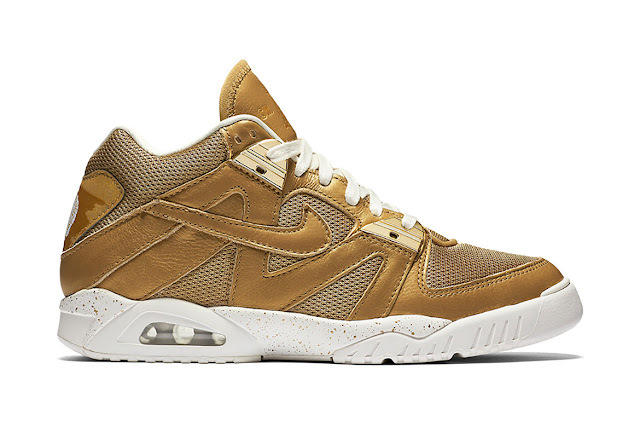 The brand’s Air Tech Challenge III model goes for gold with a striking Metallic Gold/Metallic Gold-Ivory colorway that details the shoe with the metallic hue allover, plus a white midsole flecked with gold speckling. The brand also brings back the vintage tennis ball logo as a standout detail on the heel that illuminates in the dark. Watch for the Nike Air Tech Challenge III “Wimbledon” to release just before the tennis tournament kicks off June 27.
adidas Y3 Qasa High "Vista Grey"
Gucci Mane "All My Children"
Rick Ross x Wale x Meek Mill "Make It Work"
ScHoolboy Q x Kanye West 'THat Part"
DMX x Styles P "Still Scratching"
Gucci Mane x Drake "Back On Road"
Pusha T x Kendrick Lamar "Nosetalgia"